If you ride bicycles, mopeds, or small motorcycles you know how traffic lights do not often change for you like they do with cars. Many bicyclists will go over and press the pedestrian button to let the light know that they are there and are requesting a green. There is a better way. Understanding how the vehicle detectors embedded in the pavement work, and where to position your bike to cause it to recognize your presence, can be life-changing. Never mind those strap-on magnets. They don’t seem to work, and you don’t even need them anyway. All you need is an electrically conductive loop placed where enough magnetic field lines pass through it, and blink, you get a green light. And guess what, you got two of them already on your bike right now. They’re your rims. Your rims are your secret weapon. The way modern on-demand traffic lights work is by buried metal detectors in the street. They are the same type of metal detector that finds coins at the beach, but bigger. In the past we had weight detectors, 5ft by 1ft rubber coated pressure switches that would trigger when a car tire rolled over them, but not someone walking. There are still a few around, but they’ve all been replaced by loops of copper wire buried in the pavement. The loop detectors work on electricity and magnetism, so even a ton of bricks or an all-plastic car would not set them off. You need a certain amount of metal close to the ground. Actually, it’s not the amount of metal, it’s the shape, size and positioning of it. In a dipole loop detector, there are two poles, a north pole above the street in the center of the loop, and a south pole under the street. All of the magnetic field lines are perpendicular to and encircling the wire loop in a donut shape, pointing down inside the loop and up outside the loop.The idea is to put your rims on the wire, in line with it. That way the maximum number of magnetic field lines will pass through your rims. So you should stop on either side of the loop, not in the center of the circle. 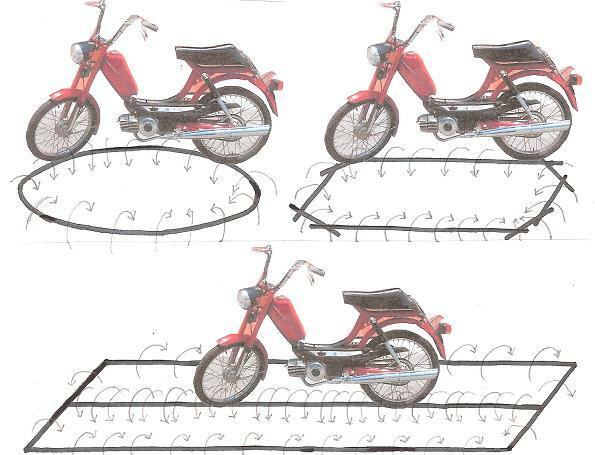 Furthermore you should turn your front wheel to follow the curve of the loop, to capture more field lines. Two bikes, side by side, on the loop is twice as effective. In a quadrupole loop detector, there are four poles, a left north above the street, a right north below the street, a left south below, and a right south above. It is just two opposite pointing dipole loops side by side. In practice, the loops are very long rectangles, 1 or 2 car lengths long. With quadrupole loop detectors, the line down the middle is where you should put your rims. The middle wire is twice as sensitive as either side wire is, since twice as many field lines pass through your rims. These detectors are better at detecting bicycles than the dipole type. Some bicycle-friendly communities have small quadrupole loop detectors for bicycles with a white dotted line on the center wire and a sign showing a bicycle stopped on the white dotted line. Here are some more specific ways to make traffic lights turn green for you. If there’s more than one circle, as you pull up follow the curves of each circle with your tires. As a last resort, you can lay your bike down flat above the detector. Always try to let cars trigger the detectors for you, when possible. The following things cause more magnetic field lines to be enclosed by a conductive loop and thus trigger the detector easier: bigger diameter rims, thinner or lower-profile tires (by lowering the rims), bigger and lower engine. Better than any bike would be a 6ft by 6ft sheet metal about 1ft above the street. That would look just like a car to the detector. Better than anything is an extension cord, plugged into itself, and placed on the street exactly over the buried wire. It’s time to stop being penalized for not being inside a steel and glass cage. May you live long on two wheels and feel free to make as many left turns as you wish. You are currently browsing the archives for the Traffic Lights category.